Zhaobao Tai Chi is famous for its practicality in combat, at the same time, it also well known as an exercise for health. Zhaobao Tai Chi emphasis on agile and circular movements that appears to be never-ending. Zhaobao Tai Chi offers health benefit that helps massage internal organs such as: heart, lung, liver, spleen, kidney, stomach, and intestines. Zhaobao Tai Chi Straight Sword consists of 57 movements. It emphasizes on circular movements of the straight sword and the traveling path. 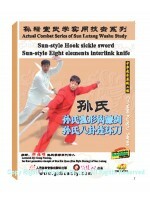 Zhaobao Tai Chi Broadsword consists of 20 movements. It's the best method to develop the agility of your body. Broadsword is easy to carry and is one of the best weapons to protect your life and so it's suitable for everyone. Content: As a one of the short weapons of Zhaobao Tai Chi Quan, Zhaobao Tai Chi Sword is played with 57 movements in round circles in which the sword moves with the drive of your body, feet and hands. One circle is crossly connected with another, freely to right or left, forward or backward. When practicing, the player and the sword should move as a whole, forcefully and flexibly.